Coming off the train in Oxford you’re a bit bummed by the commercialization. A Gap, three coffee chains and a drug store greet you. However, at your feet an aged cobble stone road caves inward, clearly aged from the past few centuries. Any degree of rain would create a river in this moat-like road. Closer to the college campus, many references to the 21st century begin to give way to a world of curving alleyways and old English street lamps. Along with the architecture, it was also the sense of ease that struck me most. You think of, say, Harvard, as beautiful but teeming with urgency and vibrant angst to get something done. Here, the whole place seems to have taken a deep breath and given into the old-world feel. A lawn of grass creates a haven for picnickers, focus groups and the causal reader. A wheat-hued stone fence barely holds in flowers and shrubbery. You can see stripping where the mower had carefully trimmed the impossibly perfect green space. I think I forgot to mention this slight detail, of which might explain the pristine state of things, but we just so happened to visited Oxford on graduation weekend and in our wanderings through Balliol, we fell upon one particularly memorable sight. A student, clearly a graduating senior, fell into the quad from an obscure stairwell up ahead. His back covered was drenched in ketchup and confetti. With disheveled hair and soggy robs, he looked and smelt like he’d endured a hosing of beer. It was one of those moments where he knew and we knew this was a “didn’t happen” kind of scene. My friends and I glanced at each other with knowing looks—we had just witness a bit more than was promised of our two pound tour. Enjoy English Breakfast at The Grand Café, one of the oldest coffee houses in England (1650). For delightful home goods, perfumes and coffee table books The Pod is definitely worth a visit and for soft fabrics and simple styles try Toast. Objects of Use had a nice collection of kitchen basics, and for a sweet pick-me-up, stop by Hardy’s, where they have an entire wall devoted to liquorish. 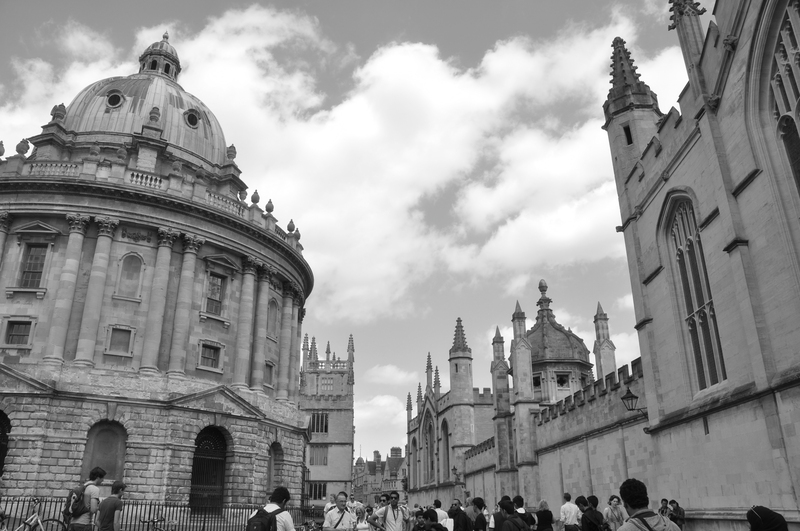 Most important, walk through Balliol and Church of Christ Oxford campuses.